Yesterday, Cincinnati Enquirer editor Tom Callinan wrote an opinion piece about Cincinnati's growing street food scene. The column discusses his past experiences with street food and elaborates on how Cincinnati's street food scene has changed since he arrived in Cincinnati some eight years ago. Personally I appreciate the comments shared by Mr. Callinan and his apparent enthusiasm for the Cincinnati Streetcar project he mentioned four times in his relatively short op-ed piece about street food. The reason for this response piece is not to challenge his experiences with great street food (I too love street food), or his passion for the Cincinnati Streetcar project (also a passion of mine), but rather to explore his explanation of cosmopolitan cities and experiences. Mr. Callinan explained how the growing street food options are making Cincinnati a more cosmopolitan place much like the Cincinnati Streetcar will. This however is putting the food cart before the horse. Street food options are not a driver of cosmopolitan behavior, but rather the result of a city becoming more cosmopolitan and craving such offerings. Likening this to the Cincinnati Streetcar which will actually drive additional lifestyle changes that make Cincinnati more cosmopolitan is inaccurate. For example, when people living at The Banks development along Cincinnati's riverfront ride the Cincinnati Streetcar to Findlay Market for their weekly shopping needs it is not the businesses that sparked this behavioral change, it is the streetcar that enables this, as Mr. Callinan would put it, cosmopolitan lifestyle. The lifestyle changes influenced by the streetcar system will create additional demand for cosmopolitan offerings like the street food vendors Mr. Callinan details as more people, instead of cars, begin to populate our streets. You could almost view something like street food as an indicator species for the liveliness of a city. William H. Whyte's groundbreaking research in New York City examined the social behaviors and usage of public spaces, and he discovered that people do in fact have a tendency to cluster around street food vendors. This is for two primary reasons: 1) the street food attracts people to the vendor for the product, and 2) people are attracted to other people and have a tendency to self-congest. But without people on the streets to begin with, there is no demand for a street food vendor. So the question is really how to increase the number of people out on the streets if we are trying to figure out how to grow the number of street food vendors in a given area. 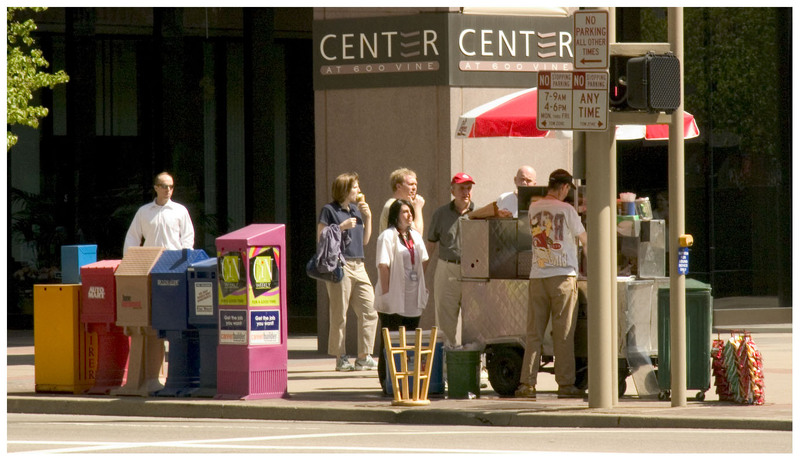 Cincinnati's food carts vie for the heavy foot traffic areas in downtown Cincinnati. The locations for each vendor is determined by an annual lottery held by the City. New York City has no shortage of people walking around the city where there is a proliferation of these fantastic street food vendors. And it is no coincidence that Cincinnati's food carts fight over the spaces surrounding Fountain Square during the annual lottery that allocates food cart locations. 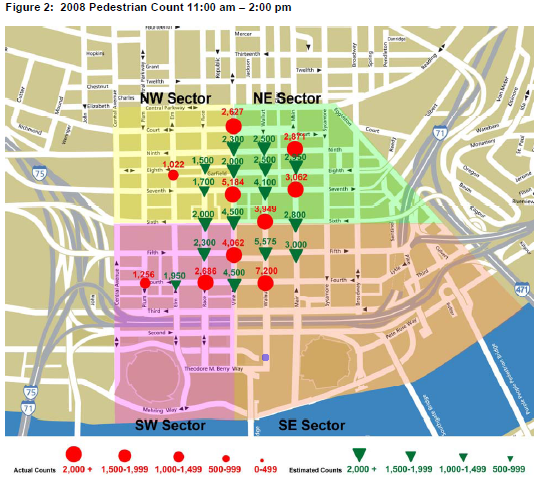 Those food cart spaces are located in the highest pedestrian count areas of downtown Cincinnati where each of the nearby intersections boast between 4,000 to 7,000 pedestrians per hour between 11am and 2pm. 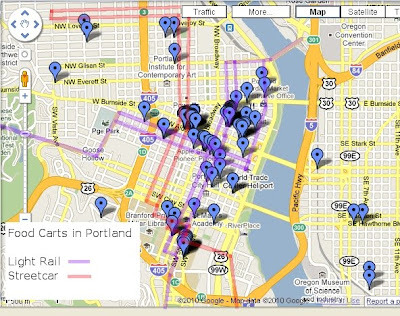 But what about street food vendors in Portland that is the oft-cited streetcar case study for Cincinnati's contemporary proposal? Marisa Robertson-Textor wrote for Gourmet Magazine that, "Portland's bustling street-food scene may soon be rivaling the hawker centers of Singapore in terms of quality, scope, popular appeal, and value for money. In other words, the Pacific Northwest is doing for street food today what it did for coffee in the 1990s." She went on to say that picking just eight venues out of the sea of stands, stalls, carts, trucks, trailers, and even bicycles was a tough job. 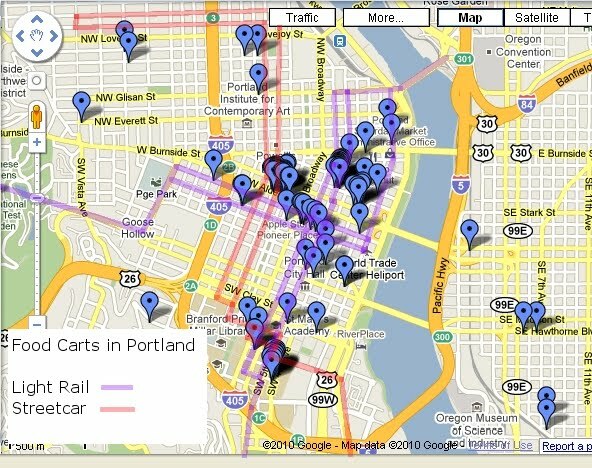 Portland's street food vendors tend to cluster around the streetcar and light rail lines...especially so around line crossings. I spent the last week in Denver where I visited one of America's most famous street food vendors. I got to speak with Jim Pittenger, owner of Biker Jim's Dogs, during that time about his gourmet hot dogs that have drawn national acclaim and recent praise from food rock star Anthony Bourdain himself. Jim's loyal assistant explained the importance of a high foot traffic location to me, and said that their prominent location at 16th & Arapahoe streets in the heart of downtown Denver has been critical to their success. In Cincinnati we need to continue to do things like remove the hideous and life sucking skywalks, build modern transport options like the Cincinnati Streetcar to give people greater options to get out of their cars and onto the streets so that we can continue to create additional demand for the wondrous street food vendors that help make cities great. Great piece. It's really amazing how street food vendors can activate public spaces in ways other uses cannot. The activity, coupled with the smells, always makes for a great urban experience. Interesting post. And thanks for the William Whyte link! My understanding is that the main issue with street food vendors it the lottery that is held each year that determines what location you get. I have heard allegations that the lottery is rigged and/or stacked in the favor of larger companies that operate many different carts. It's all about location.